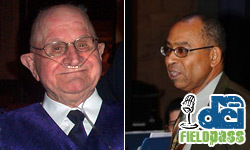 This week, DCI's Dan Potter gives us the back-story on two more of this year's Drum Corp International Hall of Fame inductees, former Kilties music director Emil Pavlik as well as Suncoast Sound and Cadets of Bergen County brass instructor Frank Williams. Click to listen. (MP3, 20:59, 19.2 MB) Right click and "save as" to download. Learn more about the DCI Hall of Fame. Subscribe to this podcast through iTunes. RSS feed. Field Pass archive. Have a question, comment or request for Field Pass? Leave a message for Dan Potter by phone at 317.489.9385 or by e-mail at fieldpass@dci.org.